Valence House Museum were intrigued by a painting by John Robert Wildman in their possession as ‘Mrs Mary Linsdell (b.1805) and her daughter Annie (b.1841)’, which was donated in 1942 by Annie’s son-in-law. 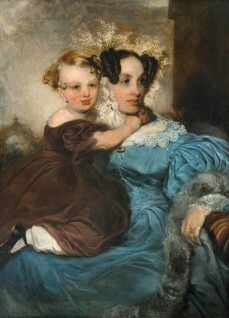 The painting is dated c.1837. Annie was the fifth child and third daughter of Mary and her husband Thomas, born late 1841. However, Wildman stopped painting in 1842 following the death of his wife, so Annie would have only been a few months old when the painting was completed. Could the child be another of the Lindsell children? A companion portrait shows Thomas Linsdell and their first daughter Mary, by Margaret Sarah Carpenter. The collection asked Art Detectives if the costumes were consistent with c.1837, and could the child actually be a boy – perhaps their first son, Thomas (b.1835), in a typical pre-breeching gown of the period? Early comments were in unanimous agreement – the child is depicted wearing typical clothing of boys up until the age of about seven. A comparable dress can be seen in the V&A collection. Can these costumes confirm which child of Mary Linsdell is depicted?